As the Celtics dispatched the Sixers with shocking ease, observers were quick to point to Al Horford’s defensive heroics and Terry Rozier’s sudden emergence as instrumental in Boston’s unexpected conference finals appearance. After all, Boston needed to stymie Joel Embiid (which the supposedly stout Heat couldn’t do in round one) and create offensive opportunities without their superstar ballhandler (which Boston struggled with against the Bucks) in order to advance past a favored opponent. Horford and Rozier came up huge, and because of them, Boston now has a date with LeBron. Meanwhile, Jayson Tatum, a 20-year-old rookie going up against the NBA’s fourth-best defense, was busy doing the things that were expected of him. That meant leading the series in scoring, playing great defense, and carrying his team’s offensive load without issue. The Sixers couldn’t do a thing to stop him, and as Boston has steadily become more injured, Tatum has become increasingly comfortable as the squad’s primary option. He averaged 23.6 points per game for the series on a 62.6 true shooting percentage. He dropped 10 points in last night’s decisive fourth quarter, including the layup that gave Boston a two-point lead within the last 24 seconds. Boston’s problem all year has been scoring at an elite level. Without Kyrie Irving, the thinking went, they were screwed when they ran up against an elite defense like Philly’s in the playoffs. But after a season of steady scoring, Tatum kicked it up a notch against Philly, scoring all over the court, breaking down their defense, and going into Embiid’s chest. He resembles a young Kevin Durant, all limbs and swagger, creating wonderful little angles and going at anyone who’s supposed to stop him. His 39 percent free-throw rate in the playoffs is in the range of a foul-drawer like DeMar DeRozan, and it indicates how he’s elevated his game in the playoffs. Tatum was, of course, great throughout the regular season, leading the team in minutes and shooting 43 percent from three, but nobody would have blamed a player his age for deferring a bit in the postseason. 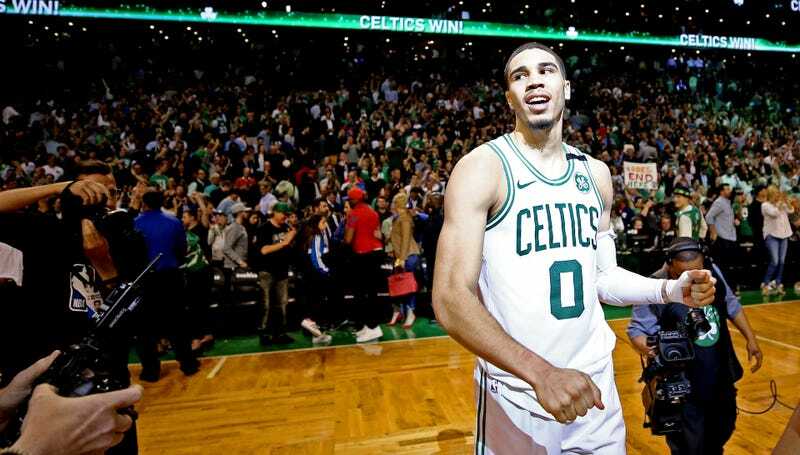 Instead, Tatum gobbled up even more responsibilities, and looked eager to have the ball in his hands at the most crucial moments of the series. With two minutes left in Game 5, the Sixers capped off an 11-1 run to take a four-point lead. Had the Sixers held on, they’d head back to Philadelphia with all the confidence in the world and a great shot to force a Game 7. Instead, Tatum took over, tossing a great alley-oop to Horford, hitting a pair of free throws, and making the back cut that more or less ended things. Here’s the oop. Ben Simmons’s series-long collapse should only leave you more impressed with Tatum, who made a very specific sort of history last night. The following stat is, I think, a neater encapsulation of how special he’s been. And to beat Lebron James, he will need to do it at an even higher level. Unless James is on him, Tatum should have a good time against Cleveland’s wing defenders, though he’ll need to shoot better from three than he did against Philadelphia (31 percent). He probably won’t be able to go toe-to-toe against LeBron James because, come on, this might be LeBron’s best postseason ever. But getting there is impressive, and Tatum looks enough like a star that he won’t back down from the challenge. God help the Eastern Conference when someone this good becomes his team’s third option next year.